Get authentic Asian flavors and tons of nutrients with this colorful salad. While the dressing is the key to its flavor, each ingredient brings its own impressive nutritional resume. Cabbage contains a large percentage of your daily requirements for vitamins K and C, as well as gut-friendly fiber. Carrots and cucumber will up the volume of nutrients and density of the salad itself, helping you stay full and fueled. The same goes for healthy fat sources like peanuts and avocado! Even if you aren't vegan or vegetarian, you'll discover how delicious tofu can be! Plus, it never hurts to mix up your protein sources. Drizzle the avocado oil in a pan and brown the tofu on medium-high heat. Mix the vegetables in a bowl and top with the tofu and slices of avocado. Sprinkle the Thai basil, cilantro, and chopped peanuts on top. 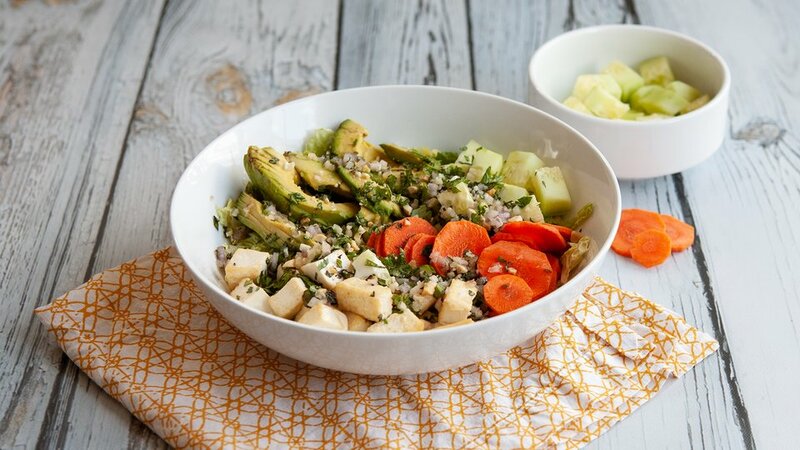 Mix all ingredients for the dressing in a small bowl and drizzle over the top of the vegetables, tofu, and avocado.